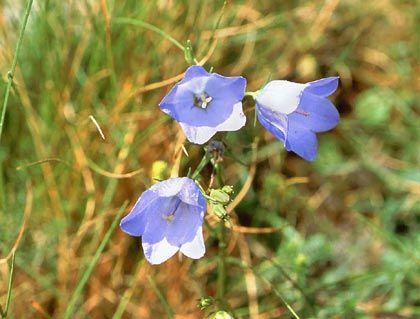 Harebell is not easily confused with other wild plants on this web site. 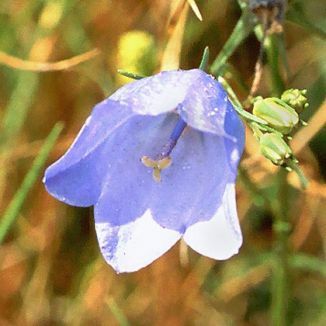 From July to October it is such a delight to find Harebell with their pure blue, bell-shaped, delicate flowers. They nod and shake and dangle from thin, curving stems in few-flowering panicles. The 15mm bell flowers have a five-lobed corolla and calyx lobes which are very much shorted than the corolla. The leaves are narrow on the stem but round at the base of the plant where they wither early. The fruit develop as dry capsules. This plant is found on limestone mountains, heath and dry grassland and dunes. It is a native plant belonging to the family Campanulaceae. I first identified this plant in 1973 at Rossadillisk, Co Galway and photographed it at Bishop's Quarter Beach in the Burren, Co Clare in 2002. The gossamers wander at their own will'.